The face of fashion ecommerce is undergoing a change. The transition from a brick-and-mortar store to an online one is accompanied by perennial problems, leading to a high return rate of ordered items. However, the online fashion and apparel industry continues to adapt to this change through use of new technologies and strategies. Other than adhering to prevalent industry best practices, you can also come up with innovative ideas that can help you attract, engage, and retain more visitors on your website. Here are 6 ideas on how you can grow your online apparel business while maintaining your brand esthetics. Based on these ideas, you can create variations and run A/B tests on your website. Cross-sell an entire set based on season, style, festival, and others, while providing a stand-out description. You plan to add sneakers with a new design, an offbeat color, and a slightly higher price compared to your current best-seller in the same category. On your website, it would show up in the Shoes and New Launches categories. Other than this, what can you do to have your visitors go for it? Don’t leave the sneakers alone. Showcase those along with items from other categories with which these can go along well. Look at what Zalando, UK does. Within each category such as Men, Women, and others, it has a subcategory Inspiration, which includes the Looks of the Week section. This section showcases a new item with additional items to complete the suggested outfit. Over and above this is the vivid description, which can attract visitors to go for more than they are looking for. The updates ensure freshness through new themes every week. The above idea is primarily used for new launches during a particular season; but you can also A/B test and apply it for upcoming festivals, events, and other special days. Add sale discount percent and cloth material as filters along with size and other filters within a category/subcategory. At times, it becomes tricky for your customers when they find the desired apparel item, but not the desired price. The reverse is also a common sight. How do you save them from an endless search on your website pages? Lyst has addressed this problem to an extent. There are additional, unique filters for its customers to fine-tune their search. In the above screenshot, two of these filters—sales discount and material—are used to narrow down the available options. Add color and designer name as filters along with size and price. While adding size and price filters helps your visitors shortlist and display what’s available for them, having colors as a filter helps them personalize their choices. If this, along with other filters, still leaves the visitors with a high number of displayed options, you can provide more filters, such as designers. 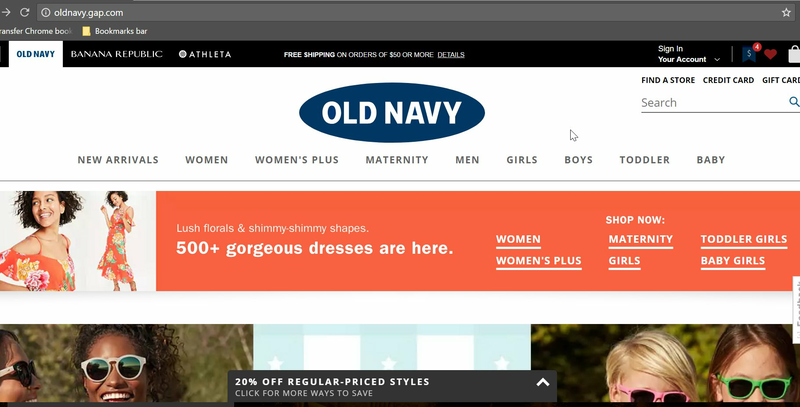 In the screenshot from Otte New York, selecting 2 colors and 3 designers in the New category narrows down the comprehensive product listing to a more manageable 10 products on the screen. Interaction Analytics: Use heatmaps to see if new options are resulting in increased activity on the filters. Allow products to be earmarked by visitors for a sales reminder. Do you see the message between two products on the Lyst category page? While it’s good to have increased visitor engagement on your website pages, this message tells the visitors that if price is a bottleneck, then they have the option to “wait and get” what they are looking for. This can encourage them to not only indicate their choices, but also bookmark the website for a future revisit. While you can go ahead with this idea and A/B test it; on the same lines, you can also go for similar triggers checking with the customers softly if they need any help while finalizing their current purchase. Note: You should not test similar ideas together. It may make it difficult to attribute your results with the correct idea. Also, excessive triggers and interruptions can lead to unpredictable visitor behavior. Share cross-selling offers on the apparel product page. Use heatmaps and past data while planning such promotions. In the screenshot from Farfetch, UK, note the brevity and clarity in the cross-sell message, and the optimum position in which it is placed, as opposed to a “Recommended products” carousel after the product details. Your offer details should not mix with the product description. Offer similar or complementary products together. Such offers should not distract visitors away from the product page they are on. Instead, the combined value of the products should attract them to go for it. Note: Amazon makes about 35% of its revenue from cross-selling. 1) Provide the option to view close-ups of items on fashion product pages. Remember those models on your television screen posing with the latest designer suits, followed by close-ups of the suits from different angles. This idea goes on to mirror the same experience for your customers. 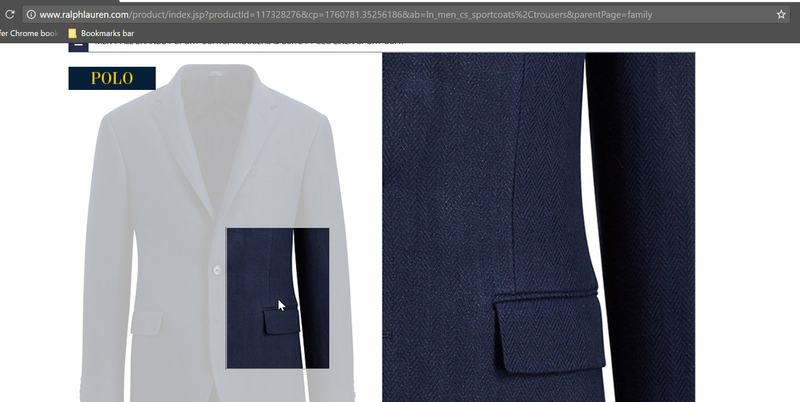 The above image from Ralph Lauren shows how visitors on your site can get to see a zoomed-in view when they select a particular section of the product. Interaction Analytics: Use session replays to see engagement with the feature. There may not be a direct correlating impact on the revenue as a result of this change. However, increased engagement could mean a better customer experience. Segmentation based on multiple requirements would just make it so easy for your customers. Here, Old Navy comes up with a standout idea. On the home page itself, size comes into picture right after the gender. For example, Women and Women’s Plus are two categories differentiated on the basis of size. Maternity comes out as another unique category. In addition, the visitors can also specify their body types to narrow down their search. For example, the Boys category has Husky and Slim as two differentiators. Time to purchase should go down, as the visitors should be able to quickly self-select. Conversion rate should go up. Interaction analytics: Engagement should be higher. By now, these ideas would have created a chain reaction of sorts for you, helping you come up with more ideas to A/B test. So if there’s something that you would want to add or suggest, please share your responses in the Comments section below. Interesting points to know from your article, along e-commerce sales tracking will also help to understand the sales from different sources, cart value, region. Thanks for providing the testing ideas for e-commerce sites. Very helpful for people who are running their sites the tips are amazing.